Last year we have been putting lot of efforts, and after long time, we have brought to the air our own on-line VSAT training portal, to be used by our engineers. We are very satisfied with the result, and we will keep improving it. Now, we are taking another step forward in the same direction, and I will be travelling to Dakar to provide a 4 days theoretical and hands-on training. The cost of the training is reduced if you are registered engineer with Oasis Networks. The training is suitable for field engineers that already have some experience with VSAT. We will cover some theoretical aspects, going from the basics of electromagnetic waves to practical aspects of our work on the field. Certifications of Oasis will be granted as well for the engineers who will pass the exams along the training session. Anyone interested, please contact me to secure your seat. Afrikanet Oxford Consultech UK Ltd. offer GVF certified courses all over Africa at subsidized prices. See their GVF training courses brochure (295k pdf file - worth reading) for more information about the different courses offered. For a class of at least 5 students, a discount of 20 percent is offered. 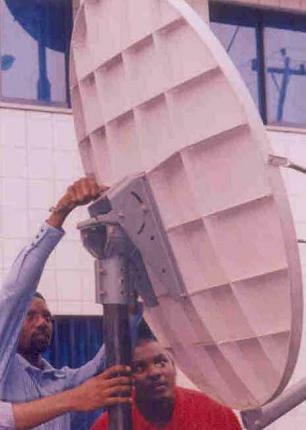 Intensive VSAT Training courses, typically held in Nairobi, Kenya. These courses offer both theoretical and practical skills transfer as applicable to SCPC, TDM, TDMA, FTDMS etc, for VSAT field engineers, support engineers and operational managers. 1. Want to know more about satellites. Any one that wants to understand the basics of satellite communication. 2. Want to install VSAT systems. Engineers and installers needing practical experience on installing and commissioning VSAT equipment. 3. Need to gain knowledge of the satellite industry. These are decision makers and buyers. 1. Why we use Satellites. Reasons why satellite is used opposed to fibre, cable or microwave. 2. How does Satellites work? Detailed explanation of a satellite from design to operational. 3. VSAT Network Design. Components that make up a VSAT network. 4. Link Budget. Explanation of why we need link budgets and how to understand a link budget. 5. VSAT Services. Discuss the different types of services and the benefits of the types of services. 6. Practical Theory. Understand the process from applying to commissioning of a VSAT site. 7. Demonstration of a dish built and alignment. * RF measurements, Cisco IP routing and switching. We look forward to be of service to you, should you need more information and to register for this event. The registration fee normally includes the Course handbook and CD, administrative costs, Certificate issued on successful completion and meals and refreshments during the course. Ask when is the next course, what will it include, prices and registration form. Example details: VSAT Engineering Course : 23 - 27 Aug 2016, Nairobi, Kenya Note this is not up to date - ask below for current plans.